1. Cut the small potatoes into thick slices. Put in boiling water for 4-5 minutes, until just tender but still holding their shape. 2. In a pan, heat olive oil over medium-low heat. Add onion, potatoes, salt and pepper. Cook until the potatoes have started to brown and are soft, 10 to 12 minutes. Stir in rosemary; cook for one minute. 3. 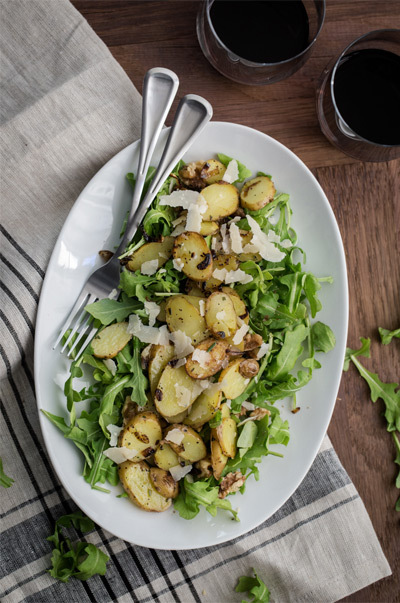 Combine the arugula, potatoes, walnuts and Parmesan. In a small bowl, whisk together dressing ingredients; pour over the salad, and toss until everything is well-combined.